Diamond is a stone of beauty and perfection. The fact that a diamond can only be shaped and cut with another diamond shows the strength and power of the stone. Its hardness comes from the carbon atoms within it bonding strongly together, making the stone nearly indestructible. Diamonds can be found in a wide variety of colors such as white, black, colorless, pink, yellow, red, orange, green, brown, blue, and even grey. This precious stone has been known about since the beginning of record keeping making it extremely hard to actually say when humans discovered them. It’s also been recorded as “Diamaunde”, in the old Oxford English Dictionary of 1310. The earliest known locality of diamonds has been thought to be somewhere within common day India. The name was derived from the Greek word for “invincible”. 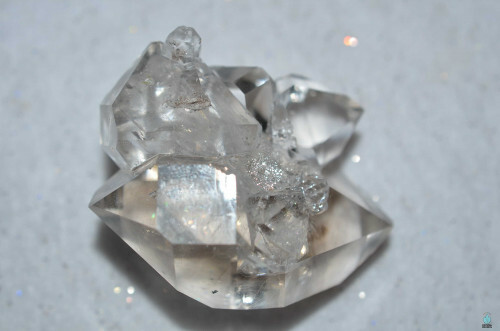 Aside from the value and legacy of diamonds, they also posses very powerful healing abilities. Throughout time, Diamonds have been considered the stone of winners and is said to offer access to powerful Divine energy. This is why royalty or people in high power such as kings, queens, emperors, and pharaohs wore diamonds on their clothing or head pieces. These individuals were viewed by others as beings of higher power, and those that have the ability to channel Divine energy. In current times, diamonds are used mostly for adornment due to its representation of sheer beauty and brilliance. Many people have come to know Diamonds as tokens of love and relationships as it is usually placed in wedding and engagement rings. “A diamond is forever”, a popular line I'm sure we have all heard. Diamonds are very high frequency stones that can open all chakra channels, giving out positive healing properties. This stone is closely associated with the 7th chakra (crown) as it unites the mind and body into one spiritual being. By doing so, they help us reach deep inside of our conscious mind and awaken all types of spiritual doors. Diamonds promote incredible power, improving emotional growth, and endless loving energy. They will attract self respect, self love, and unconditional love for you and the people closest. Diamonds hold a very powerful energy that many people take for granted. When one taps into its energy, they will find that it greatly enhances inner vision. This occurs by allowing one to see and realize how much love and tenderness they receive from others and the world itself. Its a gem of great power and truth, showing us to not take for granted what we already have. The happiness that flows through your body when wearing diamonds is not just because of what they represent, but actually do to the positive energies free-flowing throughout the body.